Sanjog: Today most organizations are recognizing the value of going digital when it comes to a supply chain, but they introduce it only as a point solution to automate specific processes or functions. This is a fragmented and opportunistic approach that may be undermining the supply chain. The discussion here is to explore how organizations can define and adopt digital in one holistic approach to operating supply chain across the globe. Jamie, what do you see as the business challenges and triggers that have increased the need to improve supply chain and the global trade management? Jamie: Well, I’d say that when you look at the changing consumer preferences and shopping patterns coming from Tailored Brands, a retail organization, there’s been a significant shift. It has forced us to transform our business. You need much more precise control over inventory and visibility of where your future inventory is. There’s increased demand for transparency on where products are coming from, particularly with millennial consumers. From a Tailored Brand perspective, our MO is to put the customer first and the big shift in our business in recent years has been towards mass customization—customers being able to create their own products in our stores, a custom suit or a dress shirt and then have that manufactured to their specifications and what they’ve chosen, and then brought it to them and personalizing it. That’s very different from the business just not that long ago when you had purchase orders for thousands of units coming in, and you put them in your stores and sold them to thousands of purchase orders for one unit for a specific customer. We’ve really spent a lot of our time and effort around evolving our digital supply chain to manage through these changes in consumer preference and in the mass customization of products. Sanjog: External parties, which would include suppliers, logistics and service providers—they all come from different business and financial conditions and even different risk profiles. If you’re trying to go ahead and build as an organization, and need a holistic, sustainable and inclusive digital supply chain strategy with a long-term approach for execution—how would you go about doing it? Jamie: I think it all starts with knowing that you need highly collaborative relationships with your outsourced providers and business partners. It becomes part of the evaluation process for whom you choose to do business with. It’s no longer an “Us against Them” strategy. I’m responsible for sourcing at Tailored Brands. Earlier, we were constantly working with our factory bases to maximize our costs, but over the last couple years we found that taking this collaborative approach and understanding where we have a need to interact and work together, has been really helpful. You need to share the vision that you have for your entire supply chain network with your vendor base and gain commitment from those who are willing to help to do whatever it takes to partner with you and your company on that same journey. They might have their own journey that you should be listening to just as equally to understand where you might be able to help. So long gone are those days when you are managing just your company assets in the supply chain. Today, you need to start viewing it as one ecosystem and having two way communication with all the external partners and you need to create more win-win solutions along the way that everybody benefits. As Braggs explained, defining and adopting a plan to fully transform supply chains onto a digital platform will allow the full functionalities of digitization to reach its full potential, which will further improve your company's visibility and overall logistics operations. It begins with outlining your company's agenda with potential opportunities that could benefit from digitization and creating a system that solely enables IT components that will analyze massive amounts of data in your systems' processes. 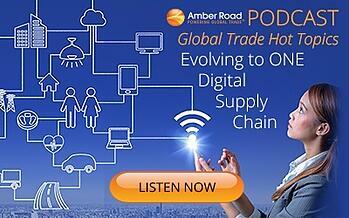 Listen to the full podcast here to learn everything you need to know about what supply chain digitization has to offer!.